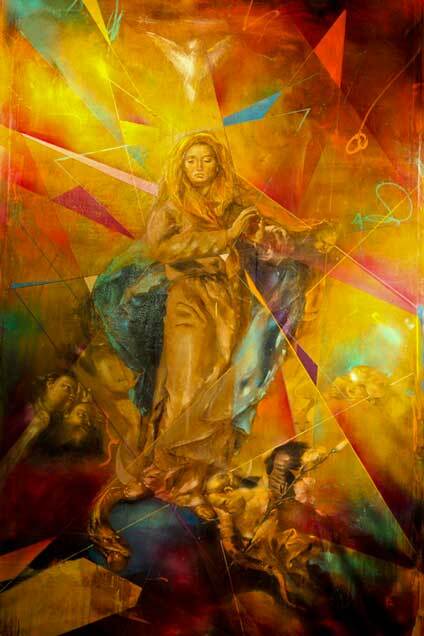 The Immaculate Conception, 72 x 41 inches, spray enamel, oil paint, oil pastel and bitumen. In this exhibition entitled, More Force than Judgment, Poesia draws inspiration from a quote by renaissance biographer Giorgio Vasari describing the work of Tintoretto. The quote resonates with Poesia because of his involvement over the past two decades with the graffiti movement. Graffiti as an art form has not usually been taken seriously because it is perceived as consisting of actions and aesthetics that have to do more with force than judgment. Art historians and collectors in the past have been unable to make the connections between the power of a spray painted tag on the street, a Pollock drip on a canvas, or a Tintoretto sketch on a piece of paper. These relationships are made synonymous on these canvases as a pointed metaphor about the importance of the graffiti writer's mark on art history, as well as on the physical world itself. In the paintings themselves, Poesia creates a direct dialogue with art history and graffiti's recently recognized, yet still contentious, central role in it in the new millennium. The compositions involve revised versions of old masterpieces that are influenced by the artist's history as a graffiti artist and the techniques and materials that he uses. As his traditional subject matter, he repaints historical masterpieces from the High Renaissance through the Baroque period. As his challenging commentary, he utilizes geometric abstraction to slice into them and graffiti tools wielded with an expressionistic stroke to disperse and obscure them. Poesia uses this visual dialectic to create a simile between new millennium masters and their historical counterparts, thereby making a statement that elevates both the art form and their practitioners, as well as progressing it's stylistic palette into the future.